With a haka and chanting, this group of men and women is giving a pōwhiri (formal welcome) to New Zealand veterans of the Vietnam War in 1998. The woman in the foreground is brandishing a taiaha (traditional weapon) and she and other women in the welcome party have adorned themselves with green leaves as a sign of mourning for the dead. 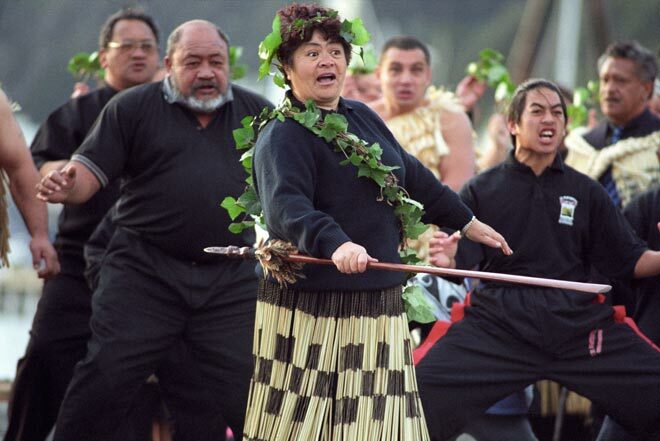 Increasingly, pōwhiri are held outside the setting of a marae, and this one is taking place on Wellington's waterfront.